Hollywood mu sic composer Chris Lowndes has just bought a home in the Yorkshire Dales with a very creepy history. A famous murderess allegedly killed her husband in his new office. Death by poison. The portraits of the home’s old inhabitants still cover the walls of the large old home, and Chris finds himself enthralled by the mystery. He begins to ask questions of the townspeople about the Fox family, and begins to wonder if Grace Fox was hanged wrongfully when he learns that there is just no real concrete evidence or motive, aside from the fact that the beautiful matron was having an affair with an artist half her age. The composer is swept up in the details of the beguiling woman’s woeful story to the brink of obsession…and what he finds out is more horrifying than anything anyone could possibly imagine. 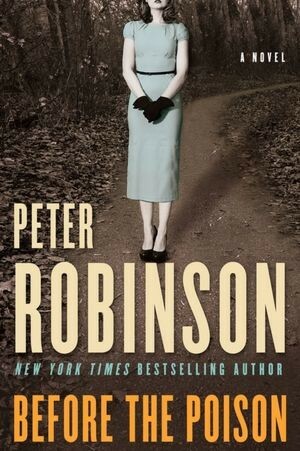 Fans of Kate Morton (The Distant Hours, The House at Riverton, The Forgotten Garden) and Kimberley Freeman (Wildflower Hill) will LOVE Peter Robinson’s Before the Poison, which travels through the past and present, tracing Grace Fox’s life serving as a nurse in the war throughout Chris Lowndes’ quest for the truth. Peter Robinson is also well-known for his Inspector Banks Mystery Series, if you find that you like his style of writing and want to get a taste of something else he has written you should give the series a try. Look for Before the Poison today-but only if you think you can “stomach” it!